These two covered a surprising range of light intensity in a single ordinary exposure, with editing of course. Heathcote Botanical Gardens in Fort Pierce. The light show is on 5:30 to 9, Friday and Saturday through the end of December, weather permitting. In this one, the plants behind the path have changing colors, except for the orange bromeliads. It was fun to light up the fairly elaborate flower beds rather than let them go dark. Spotlights. The better ones are from Lowe's (LED, under $11) with socket-posts from Home Depot for $5, turned on and off in a pattern by a controller that was lots more expensive, but not being used. The changing colors work well in this bamboo clump. I need to do better YouTube videos. The bamboo clump is an unexpected hit. It uses a control box that was intended to make strings of lights dim and brighten. It didn't do that real well, and it didn't do well with making dimmable LED spotlights dim, so it was turned over to making a flock of 14 color spotlights (red, green, blue, and yellow/amber/orange) going on and off. Only about a third are on at any one time. Favorite spots are from Lowe's. The blue leaks a lot of UV, so clothing and whatnot can glow in the dark. I wanted some neon-paint fish. The color patterns are fascinating and even better, a path runs on both sides. 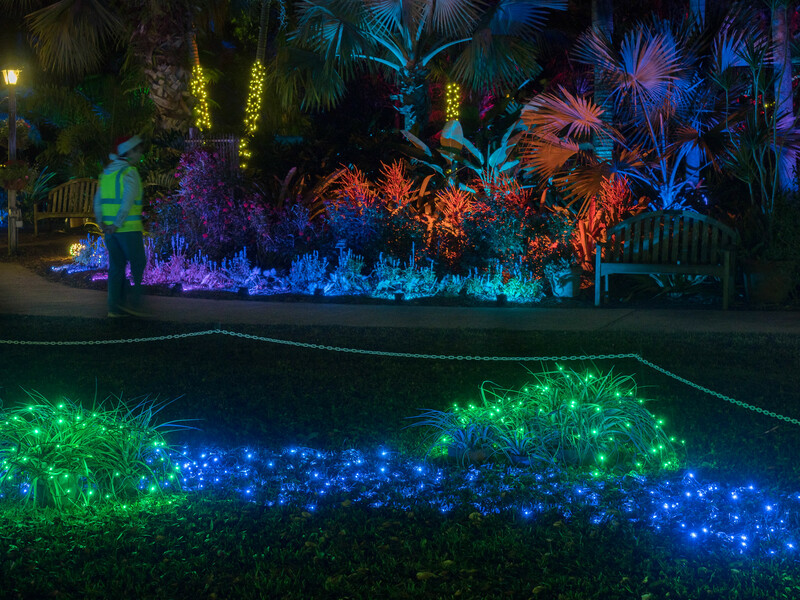 The flower bed with the guy in the vest standing in front has little 10-watt floodlights that change color by program. The two photos show the bed in different colors. The orange is big bromeliads, Aechmea blanchetiana from Brazil, where it'll live at the beaches. Nice to have those expensive beds as part of the night performance, instead of being dark. Yep, love the bamboo. The others would be great without the people distraction. Here's the pretty crummy first try back at opening. For the bamboo clump, go to about 4:30. 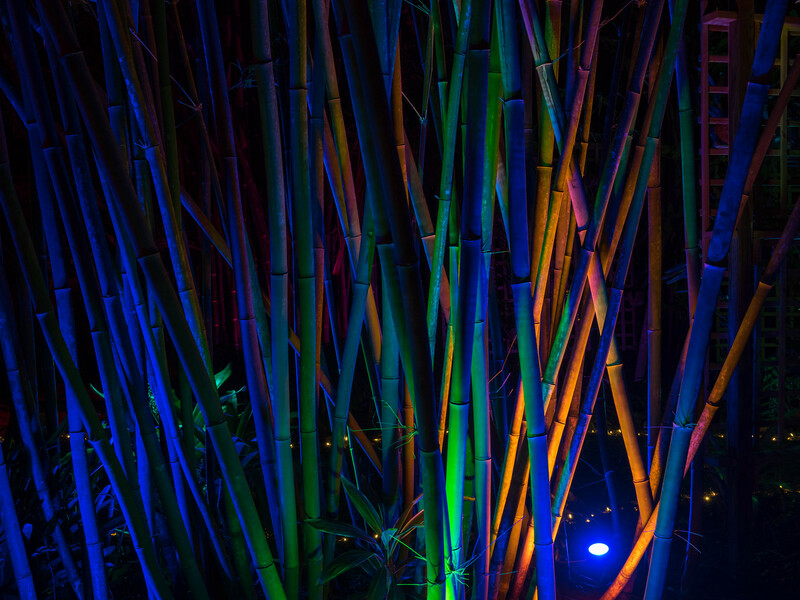 The "rain forest" with the bamboo has been tweaked a bit with more lights on the path. The garden's big deal this year is white string lights on many of the bonsai trees. Putting them into the trees was meticulous work. With a lot of trees, the lighting brought out features of the trunks and branches that you don't much notice in daylight. But hard to catch on viceo. Maybe at dusk.